Daniel is an American academic married to a reclusive former film star, and living in rural Ireland. His happy second marriage to Claudette has produced two young children, to add to the ones he left in California and never sees. But he seems happy enough, until he hears a radio interview from 1986 with one of his exes – the big Ex, as it turns out. He decides to find out what happened to her, and risks his current relationship and everything else in the process. As we find out more about how Claudette came to run away from her career, and the consequences of Daniel’s investigations, O’Farrell introduces voices from characters we instantly believe in and want to know more about. One of the most memorable scenes in the novel concerns a small child being taken to a children’s dermatology clinic, “for kids who are inflamed with eczema, head to foot, kids for whom normal clothes and unbroken sleep are impossibilities”. It is beautifully written, funny, touching and desperate. The action moves easily between current day Donegal and Paris, international film sets in the 1990s and the Scottish Borders in the 1980s (among other places). This turned out to be a perfect holiday read for me, with a pacy plot and thoughtful things to say about long term adult relationships. 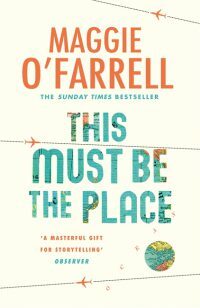 I have read all of O’Farrell’s novels and enjoyed this one the most. A selection on the Radio 2 Book Club, it’s already a swift seller in our shop. If you’re a fan of Jonathan Franzen’s The Corrections or A M Homes’s May We All be Forgiven, I predict you will love this.